9 February 2017, New Delhi: The turmoil going on in Tamil Nadu has taken a crucial turn after the resignation of O. Panneerselvam, bringing uncertainty of governance for citizens of the state. The AIADMK general secretary V. K. Sasikala is leaving no stone unturned to make sure that she is the next Chief Minister of Tamil Nadu. 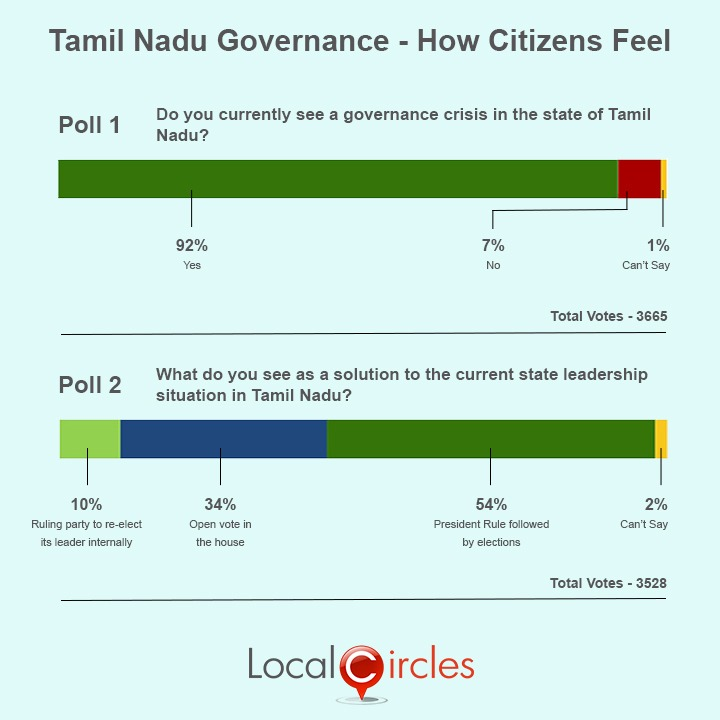 Due to many posts and comments that came up on citizen engagement platform LocalCircles on the happenings in Tamil Nadu, a survey was done to assess the current situation of Tamil Nadu. According to the responses in the survey in which 3,665 citizens voted, 92% citizens said that they see a governance crisis going on in the state of Tamil Nadu. Only 7% said that they did not see any crisis and 1% did not have an opinion. In a related poll asking people what they saw as a solution to the current state leadership situation in Tamil Nadu, 54% citizens said that President’s rule should be imposed immediately be imposed in the state followed by fresh elections 34% said that there should be an open vote in the house with 10% saying that the ruling party should re-elect their leader internally. 2% people were not sure about what should be done. 3528 citizens polled in this survey. Citizens also suggested that various steps should be taken to find where the current support of the public lies. Till this is done and a leader is appointed amicably, citizens expect the situation in the state to remain fluid.